Editor’s Note: This article was originally published on Oct. 15, 2012. Nov. 13, 2012. Officials involved with the Watauga County Comprehensive Transportation Plan finalized a draft of the plan and outlined the proposed projects, which include the U.S. 421 Bypass known as the “Daniel Boone Parkway,” at an Intergovernmental Retreat on the campus of ASU last week. The plan has been years in the making to address current and future traffic issues in the High Country – including congestion, connectivity, access and flow – as well as make the region more pedestrian and bicycle friendly. Details of the plan are outlined further below. Craig Hughes of the High Country Council of Governments joked that this project started in the 1900’s. He added that this is a vision plan and no funding is attached to the overall plan. The hottest topic in the plan concerns the U.S. 421 Bypass, which has been called the Daniel Boone Parkway in the past. This bypass around Boone has been discussed for decades. The blue dotted line represents the proposed bypass known as the Daniel Boone Parkway Bypass. He also mentioned that the High Country is missing out on N.C. Department of Transportation funding due to complacency and/or indecision regarding the project. A steering committee comprised of planning staff and elected officials from county and municipal governments in the High Country along with representatives from ASU, AppalCART, Blue Ridge Conservancy, chambers of commerce and the N.C. Department of Transportation developed the draft recommendations for the plan. The entire plan is available for public review at www.regiond.org/WCTP.html. A public survey of the plan is available at www.surveymonkey.com/s/WataugaCountyCTPRec where citizens can submit comments, which includes sections for open-ended questions until Nov. 13, 2012. After the comments are reviewed, the plan may or may not be altered. After which, the plan goes to the boards and councils of the local municipalities and governments for adoption. Then the proposed projects must be prioritized and sent to the NCDOT for funding. For more information about the plan or survey, contact Craig Hughes at [email protected] or call 828-265-5434 or contact Cooper Sellers at [email protected] or call 919-707-0978. Look below to see what’s happening in your neck of the woods. The roads involved in the proposed projects listed below are currently over capacity or will be by 2040 and/or have connectivity and access issues. Recommendation: The proposed project includes constructing a bypass south of Boone. It would be deemed a freeway with four lanes and a median. The proposed route runs south of Boone from Old 421 near Food Lion on U.S. 421 in Eastern Watauga to U.S. 421 near the Western portion of Watauga. Recommendation: Improving this section of U.S. 321- U.S. 421 in Western Watauga – from the proposed U.S. 421 Bypass to U.S. 321 in Vilas into a four-lane boulevard with a median, and four-foot paved shoulders to accommodate bicycles. Recommendation: Includes widening U.S. 221 to a four-lane boulevard with bicycle accommodations. Project currently is scheduled for construction in 2015. Recommendation: U.S. 321 from Avery County to U.S. 421 in Vilas is recommended to be upgraded to expressway – four lanes with median – with bicycle accommodations. As development occurs along this corridor every effort should be made to limit access in order to maintain mobility. Recommendation: U.S. 321 from the proposed U.S. 421 bypass south of Boone to U.S. 221 north of Blowing Rock is recommended to be an expressway – four lanes with median. As development occurs along this corridor every effort should be made to limit access in order to maintain mobility and connectivity. Recommendation: U.S. 321 from U.S. 221 north of Blowing Rock to Caldwell County – this project includes widening U.S. 321 to multi-lanes and is intended to provide mobility in Watauga County and, ultimately, connectivity between Johnson City, Tenn., and Gastonia. This project is currently under construction with the completion scheduled for 2015. Recommendation: From Vilas to Tennessee, the proposed project consists of widening U.S. 421 to a four-lane boulevard with bicycle accommodations. Recommendation: U.S. 421 from the end of the existing divided section east of Old U.S. 421 to N.C. 194 – the proposed project consists of turning U.S. 421 to a boulevard (four lanes with median) from N.C. 194 to Old U.S. 421 and to an expressway from Old U.S. 421 to the end of the existing divided section by removing the center turn lane and providing a median. Recommendation: N.C. 105 from N.C. 105 Bypass to U.S. 221-U.S. 421 to a boulevard (four lanes with median) by removing center turn lane, providing a median and bicycle accommodations. Recommendation: Proposed project consists of widening N.C. 105 to four lanes with bicycle accommodations. Recommendation: Bamboo Road from Wilson Ridge Road – This project consists of widening Bamboo Road to 12-foot lanes with a four-foot paved shoulder accommodate bicycles. Intersection improvements are recommended at Wilson Ridge Road. Recommendation: Deerfield Road from State Farm Road to Bamboo Road – This project consists of widening Deerfield Road to 12-foot lanes with a four-foot paved shoulder to accommodate bicycles. Intersection improvements are recommended at Wilson Ridge Road. Recommendation: Due to lack of multiple access points to Beech Mountain from the Watauga County side, an alternative access route to Beech Mountain and U.S. 321 is desired for emergency purposes. This project consists of extending Presnell School Road to Cherry Gap Road in Beech Mountain. This would include two lanes with a four-foot paved shoulder and an attempt to utilize an existing local road bed. Recommendation: By request of Town of Boone, an investigation into connecting Homespun Hills Road to Bodenheimer Drive west of ASU has begun. This project would require a minimum of 200 feet of new location to connect the two roads, which would open up new access to ASU from N.C. 105. Recommendation: Like Presnell School Road, the NCDOT is looking for an alternative access between Seven Devils Road and N.C. 105 that would include two lanes with four-foot paved shoulders. Recommendation: State Farm Road from N.C. 105 to Deerfield Road is proposed to be a three-lane cross section with four-foot paved shoulders to accommodate bicyclists. NC 194 from Howards Creek Road to Castle Ford Road – Widen to 12-foot lanes with 4-foot paved shoulders to accommodate bicycles. Bamboo Road from Deerfield Road to Friendship Church Road – Widen to 12- foot lanes with 4- foot paved shoulders to accommodate bicycles. Broadstone Road from N.C. 194 to N.C. 105 – Widen to 12-foot lanes with 4-foot paved shoulders to accommodate bicycles. Meadowview Road from U.S. 221/321 to U.S. 221/321 – Widen to 12-foot lanes. U.S. 321/421 (King Street) from U.S. 321 (Hardin Street) to Hodges Gap – The deficiencies here will remain unaddressed as not to disrupt the business district and also because the Town of Boone found no improvement methods acceptable, which were limited to physical constraints. Small Section of Deerfield Road – This section begins at the intersection with State Farm Road and extends 250 feet to the northeast. The primary cause of congestion results from the 25 mph speed limit around the hospital. Locals prefer to maintain the speed limit. Roadways identified as bicycle routes should incorporate the following standards as roadway improvements are made and funding is available: curb and gutter sections require at minimum 4 foot bike lanes or 14 foot outside lanes; shoulder sections require a minimum 4 foot paved shoulder; all bridges along roadways where bike facilities are recommended shall be equipped with 54 inch railings. Multi-use paths are facilities physically separated from motor vehicle traffic that is either within the highway right-of-way or on an independent right-of-way. Multi-use paths include bicycle paths, rail-trails, or other facilities built for bicycle and pedestrian traffic. Multi-use paths from the Boone pedestrian plan, Walk Boone 2011, were incorporated into the CTP. 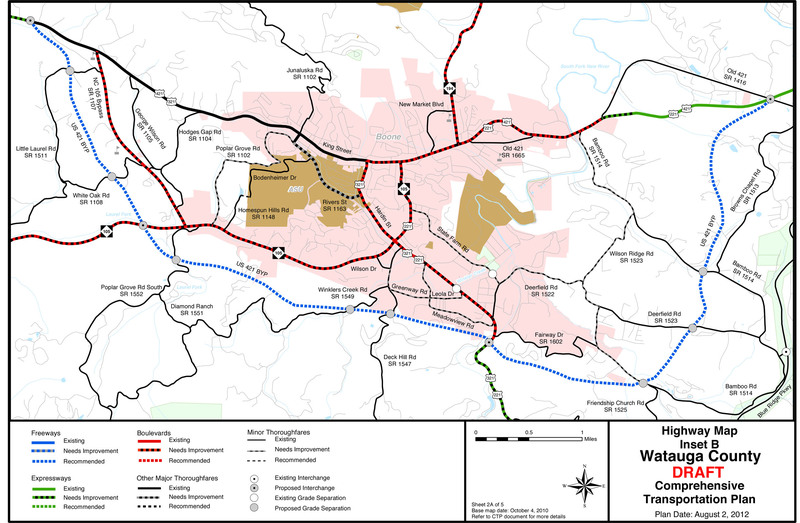 Additionally, the following multi-use path project was identified to serve the needs of Watauga County. Middle Fork Greenway: The envisioned Middle Fork Greenway would run between Boone and Blowing Rock, a distance of about 6.5 miles. The greenway would connect the existing Boone Greenway with Shoppes on the Parkway at the intersection of U.S. 221 and U.S. 321 in Blowing Rock. The Middle Fork River is part of the headwaters of the New River and as such is important to watershed, trout streams, and wetlands found in the vicinity. Watauga County Pathways 18 is a non-profit organization working towards the preservation and eventual construction of this corridor. Boone has an existing pedestrian plan entitled “Walk Boone 2011” that was utilized in the development of the pedestrian element of the CTP. The Walk Boone 2011 plan was cooperatively developed by Boone and NCDOT’s Division of Bicycle and Pedestrian Transportation. The Town of Beech Mountain Streetscape Plan was developed in 2010. The information from these pedestrian plans was incorporated into the CTP. Additionally, the following projects were recommended during the development of the CTP.